Cisco MDS 9148S 16G Multilayer Fabric Switch for IBM® System Storage® is the latest generation of the highly reliable, flexible and low-cost Cisco MDS 9100 Series switches. It combines high performance with exceptional flexibility and cost effectiveness. This powerful, compact one rack-unit (1RU) switch scales from 12 to 48 line-rate 16 Gbps Fibre Channel ports. 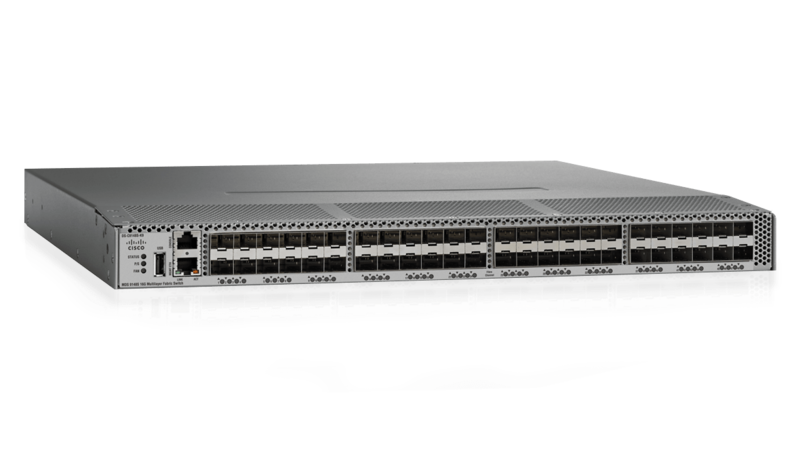 Cisco MDS 9148S is excellent for: A standalone storage area network (SAN) in small departmental storage environments, a top-of-the-rack switch in medium-sized redundant fabrics and an edge switch in enterprise data center core-edge topologies. Gain “pay-as-you-grow” scalability in a high-density switch, supporting up to 48 16 Gbps Fibre Channel ports. Provide autosensing Fibre Channel ports, delivering up to 16 Gbps of high-speed, dedicated bandwidth for each port. Boost availability with In-Service Software Upgrades (ISSU), enabling the switch to be upgraded without impacting network traffic. Offers built-in storage network management and storage area network (SAN) plug-and-play capabilities. Provides an extensive set of innovative and powerful security features and functions with the optional Cisco MDS 9100 Enterprise Package.